Soleimani’s strategy in Iraq seems modelled on the one he used to help the Assad regime in Syria. It relies heavily on recruiting local sectarian para-militaries and mobilizing regional Shi’a proxies alongside the conventional armed forces of the threatened host-state. The Iranians have a name for such auxiliaries—basijis. COMMENTARY: IRGC Maj. Gen. Gholam Ali Rashid recently stated in public the model for its allied Syrian National Defense Force (NDF) is derived from Iran's Basij . In a very loose sense, these Basij auxiliaries find an American analog in the United States Army National Guard (ARNG). It should also be pointed out regional sources indicate that preceding the onset of the 2014 Northern Iraq Offensive, IRGC Maj. Gen. Soleimani expressed dissatisfaction with the Maliki government for failing to adequately address Sunni disenfranchisement in Iraq. This IRGC dissatisfaction runs counter to the highly sectarian narrative Moarefian seeks to establish. Iraq is likely to prove an even more fertile ground for sectarian recruitment. The threat to the Seyyeda Zainab shrine in Damascus drew fighters from far afield—including many Iraqi Shi’a militias, which have now returned to Iraq to fight. The four holy Shi’a shrines in Iraq are even more religiously significant; the Islamic State’s threat to those shrines will likely mobilize many more would-be basijis to their defense. COMMENTARY: It must be pointed out the preeminent authority for Shia-Iraqi recruitment derives not from the IRGC, but from Grand Ayatollah Ali al-Sistani. While Sistani's advocacy is better described as an urgent call for enlistment in the ISF, nonetheless this call has been interpreted by many Shia-Iraqis in more general, sectarian terms. Moreover, Sistani's authority and call to arms is entirely independent of the IRGC. Iranian rhetoric has coalesced around the use of the term basij to describe Iraq’s Shi’a militias, and we can only understand the IRGC’s strategy through that prism. COMMENTARY: Rather than emphasize rhetoric and ideology, this writer recommends much greater emphasis be placed on the military model of the Basij (and NDF); in terms of organization, training, tactics, logistics, equipment, etc. It is this military model--with its proven, limited successes using available human and battle-related resources--which better assists in discerning the IRGC's pragmatic, results-driven approach toward counterinsurgency warfare. That the NDF promotes itself as a secular rather than singularly-exclusive religious armed force, further serves to undermine Moarefian's inference that this IRGC approach merely represents that of a Shia projection of hard power. IRGC leaders have something very specific in mind when they refer to Iraq’s Shi’a fighters as basijis. They are describing the phenomenon in terms not of the conflict in Iraq, but rather of the regional conflict and their strategy for fighting it. They intend to defeat the Islamic State, of course, and their interests coincide with the U.S. in that regard. But they embrace the sectarian mobilization of the Iraqi Shi’a community as part of a broader regional mobilization that they see tilting the balance of power in their favor and against the U.S. and its allies. Their enthusiastic embrace of regional sectarianism—despite their rhetorical denunciations of it—is even more dangerous for American interests, however, than their overt hostility toward the U.S. It signals IRGC support for a regional sectarian war that will continue to destabilize the Middle East and create fertile recruiting ground not only for their ersatz basijis, but for al Qaeda sympathizers as well. The U.S. cannot support a basiji strategy. COMMENTARY: Moarefian entirely omits Iran's tribal Basij that includes various ethnicities (including Arab, Kurd, Bakhtiari Turkmen and Lori) and religions (including Sunnis). He also conveniently ignores IRGC-allied NDF forces comprising Alawites, Christians, Druzes and Armenians that make up significant, successful combat forces in support of the current Syrian government. This more pragmatic, regionally inclusive and accommodating approach belies Moarefian's depiction of an IRGC in "enthusiastic embrace of regional sectarianism," and thus his stated intent to "look at the Iraq crisis from the perspective of the IRGC" is rendered, less than accurate. In response to the 2014 Northern Iraq Offensive, there are a number of pro and con factors to be identified in objectively determining American interests as they might apply towards potential military cooperation with Iran, Unfortunately, this identification and assessment is not well served by Moarefian's introductory post as it largely fails in its stated intent of providing an accurate rendering of IRGC strategic and tactical perspective, as applied toward counterinsurgency warfare in Iraq (and Syria). The reality on the ground is the Iraqi security forces are increasingly becoming a predominantly Shia fighting force, and that's how they're being perceived by the Sunnis. The main reason for this is the practical integration of Iranian-sponsored Shia militia groups into ISF and the greater role of the Quds Force in directing ISF operations. 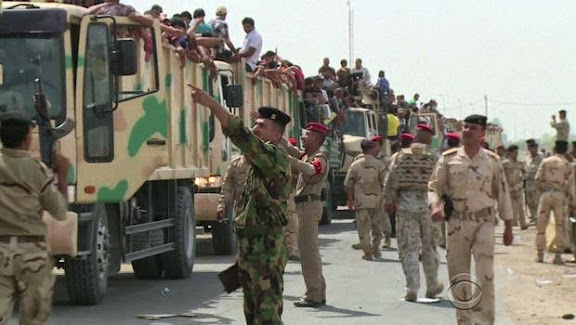 Many Sunni soldiers are also deserting their units. Although Shia militias and the Quds Force officers provide a boost to a disorganized ISF with low morale, but in the long-term the transformation of ISF into a predominantly Shia fighting force will contribute to the collapse of the unified Iraqi state. I agree with Nader, however having said that, it is important the Iraqis get the necessary support the Iranians are offering them. Right now the ISIS is controlling large areas in Iraq, yesterday they captured the Iraqi chemical weapons center near Bagdad. It is not only Shias who are disliking the ISIS, many Sunnis, even religous ones hate them. The Christians hate them, the Kurds don't like them etc. So many of them, although not a fan of Iran, don't really think it is a bad idea if Iran indirectly helps them fight ISIS. Many of them don't even consider ISIS being Iraqis although some Baathist elements are within ISIS because everyone knows the moment ISIS is established those Baathist will be executed as they no longer are needed. Kuwait is a Sunni country but they hate ISIS as they hate the Islamic fanatics but also the Baathist. So it is important we stop reproduce the same sectarian based analysis that the mainstream media is publishing. The view that every Sunni in Iraq is happy and welcoming ISIS is false. Not all Sunni soldiers desert because they are Sunnis in an Army dominated by Shias, that is not even true statistically in some regions. Some of them certainly desert because they sympatize with ISIS or dislike the Shias but the majority desert of fear or the money they get from the other side which is mainly provided by Saudi and Qatar for every soldier who deserts and leaves his weapons. This is the cheapest way of providing ISIS the needed arms by its sponsors. They skip buying expensive arms in the world markets and then find ways to smuggle it to Iraq, the total cost would be much higher. So they gave ISIS money to "buy" the weapons from the soldiers in Iraq in early stages of advancement. This way they acquired weapons quickly and cheaply and at the same time skipped resistance. You should remember that the economic situation in Iraq is not good and people joining the army as pure soldiers are not the riches ones in Iraq. As such getting some hard currency for your equipment and at the same time skip being killed in action is a good deal for the soldiers as well.